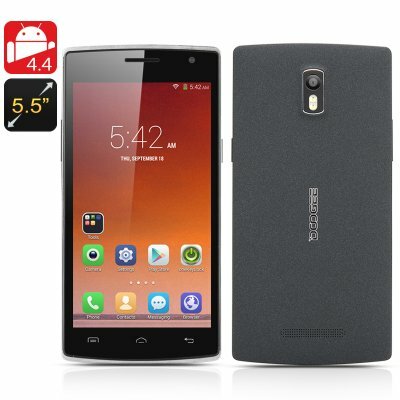 Successfully Added DOOGEE KISSME DG580 Android 4.4 Phone - 5.5 Inch 960X540 IPS Screen, MTK6582 Quad Core 1.3GHz CPU (Black) to your Shopping Cart. DOOGEE have released another smartphone onto the market using the phrase “Love and kiss me”, this is their KISSME DG580 model. An alternative for NFC technology has been available and this DOOGEE phone has it implemented into its design. Known as HotKnot, this technology does not require the need of NFC chips or antennas to work. Rather the innovation transmits information through anticipated capacitive touch boards making this a completely better approach to exchange information. By touching screen of two HotKnot compatible phones, the information exchange is finished. KISSME DG580 is the incomparable mobile phone for information transmission of the DOOGEE establishment. With a 5.5mm slim body the DG580 turns into one of the most slender models of DOOGEE cellular smartphones. Fitting agreeably in the hand; this Android smartphone also has a remarkable screen making for visual excellence, as well as for customized utilization. 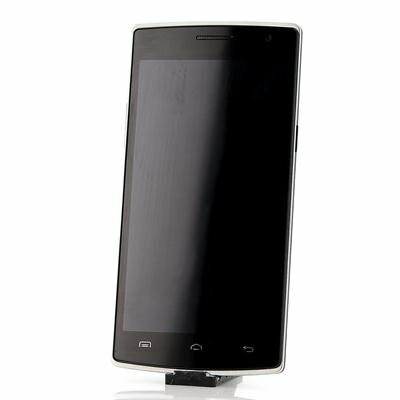 KISSME DG580 characteristics include a 5.5 inch screen that has both OGS with IPS screen technology applied. This serves to recognize the achievement of producing great detail undetected by the human eye, therefore all your content will be presented in a remarkable clear, sharp, smooth format. Have more control over your phone with the Wake Gesture function, where just a simple gesture takes you directly to a function such as camera. This gimmick not just makes this telephone feel and react pragmatic but it is additionally suitable for one-hand operation. Furnished with a built-in 5 megapixel rear camera and a 5 megapixel front-facing camera that brags a 86.4 degree ultra wide point lens, this cell phone gives you a chance to take pictures at oneself at the same separation with a more extensive viewpoint; accordingly making it simple to bring more extensive calculated photographs with more companions. Utilizing the new superior low-power Cortex-A7 quad-core chipset, this DOOGEE mobile phone makes the most of the ideal framework building design as the vitality proficiency is more than five times than an A8 processor. Additionally with the Android 4.4 Kitkat working framework, you can appreciate quick and smooth gaming, web searching and a superb working experience.